I wrote this article as one of the first articles on the website and many of the pictures and scans are poor because that was the equipment that I had at the time. Since this article was written, Ed Monroe has passed away (Sept. 07). Good bye, old friend. I have known Ed Monroe for well over 35 years. Ed is the owner of Automotive Engineering in Clearwater Fl., one of the largest suppliers of speed equipment in the country. I knew Ed back when his first shop was a small storefront with an empty back storeroom and a lot of hope. 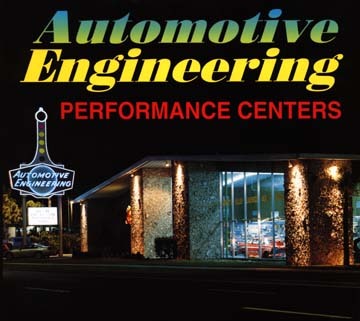 He built his beautiful facility on U.S. 19 in Clearwater in the seventies and has grown many times over the years. We got separated over the years and ran into each other at the Turkey Rod Run in Daytona in 1995. I had never seen his operation and so one night I got a call from him asking if I would like to ride out and take a look at the joint. At midnight, Ed, who is a night person is just waking up. I, not being a night person, am falling asleep on my feet. Anyhow, here we are in the quiet of the night and he is showing me the operation, which is quite a place. two stories high of any and all types of speed equipment and racing apparel. Row after row of parts, shipping, telephones, offices, and computers. I was trying to divert his attention so I could steal a transmission or something but he really has an eagle eye. The best that we could pilfer was a cold bottle of Asti-Spumante someone had left in the refrigerator in Ed's Upstairs Office. As we sipped the wine for medicinal purposes only, he began showing me picture after picture of car, and girl type models that he used during his building of this business. First were the pictures of the Arfons brothers dragcars. 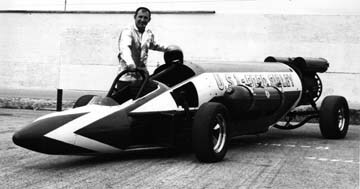 Art Arfons drag car, and Walt Arfons jet powered dragster. Walt posing, one with the chute open, one staging, and one with the chute snapping the front wheels off the ground. Next was the Ford Sibley jet car, and a shot with show the Sibley jet car tastefully appling flame jobs to a 1957 Ford. Next was a Challenger doing a burnout in the parking lot at Automotive Engineering, the Pure Heaven altered sitting in the showroom, outside with the owner in the go fast type disco pants, and thrashing on the machine to get ready to go racing. One of my favorites was the shot of the famous Willy Borst altered sitting in the showroom. Anyone who was around in the old days remembers Willy driving this roadster with the front wheels in the air and steering with one hand!